Make sure your six-shooters are fully loaded and your horse has been well watered as it’s time to unleash the outlaw within you by joining a band of train robbing bandits in the wild west to hold up the number seven train and rid it of its rich cargo! With a simple structure of 5 reels and 10 paylines, you can get in on the action with four fellow bandits from 10p up to £100 each time and the RTP of 96.70% promises to make it worth punters time and it has been mobile-optimised so you can take part in the heist no matter where you are. Developed by NetEnt, the Wild Wild West: The Great Train Heist video slot isn’t the first western-themed slot they have released and it has very high standards to live up to due to their popular Dead or Alive slot machine. It certainly does though and this could well be their best yet thanks to the sensational comic styled graphics that will remind you of the Red Dead Redemption video game, phenomenal sounds of a western tune accompanied by the whistles of the steam engine as you spin the reels and the lucrative bonus features that have been included to make it a heist well worth being part of. With a fantastic free spins feature where you’ll be boarding the number seven train with one of four types of Wild symbols active for explosive wins and a pick me mini game where you’ll select one of three safes for between 5x and 50x your stake, what are you waiting for? Grab your six-shooters and tell that horse to giddy up because you’ve got a train to catch! 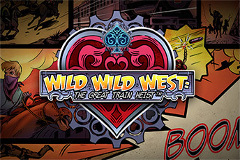 In this free Wild Wild West: The Great Train Heist slots machine you will find yourself hiding amongst the cacti in a hot desert trying to keep a low profile as you patiently wait for the number seven train to pass by, and it always does like clockwork, leaving a trail of smoke in its path for you to follow before hopping on board to collect your loot. Once you click the revolver styled spin button and watch the barrel rotate you’ll be acquainted with your fellow train robbers. Leader of the pack is a stern-eyed lady wearing a cowboy hat as she clutches hold of her revolver with her chucking up to 500 credits your way each time she shows up. You will also get up close and personal with a patch-wearing bearded gun slinger who poses menacingly with a matchstick in his mouth and he delivers up to 300 credits, the ‘muscle’ of the gang is a big dude who you certainly don’t want to get on the wrong side of as he holds a razor-sharp knife but shows his softer side by bringing you up to 200 credits, while a younger chap who has clearly been in the wars already if the scar on his face is anything to go by is also worth up to 200 credits. Catching the number seven train always results in a lucrative heist, especially whenever you land three or more Scatter symbols (the train symbol) on the reels at the same time as you hop on board to create havoc and enjoy wild times for up to thirty free spins. Landing three Scatters earns you 10 free spins, four and you’ll receive 20 free spins, while five see you armed to the teeth with a maximum of 30 free spins. Before your spins commence, the Wild Selector Wheel starts to spin and whenever you stop the wheel, a Wild feature is randomly chosen and activated which is a nice bonus. This will either be a regular Wild which acts as normal, an Expanding Wild which sees a whole reel covered if a win is possible, a 2x Multiplier Wild that doubles wins or a Spreading Wild which sees a neighbouring symbol transform into a Wild symbol too. You can even prolong the heist by landing more Scatter symbols to trawl through the other carriages and grab even more loot! On the number seven train all the most valuable items are stored away in the safe room and you’ll have your chance to get your hands on them whenever you see the Bonus symbol (gold safe) appear on the first, third and fifth reels at the same time. You don’t have time on your hands as the Sheriff’s men are on their way so you only get to pick one of the safes, however it is guaranteed to have contents worth between 5x and 50x your stake. That’s what is often said to make a horse start moving or go faster and players will certainly be shouting it in the wild west as you won’t want to miss that number 7 train! If you enjoyed this review of the Wild Wild West: The Great Train Heist slot machine but would like to get real cash instead of playing this demo version, you can play for real money at leading NetEnt casinos like Mr Green and many others.